To everyone that thought expanding the college football playoffs to four teams would end the debate about which team got left out: I told you so. Of course this just moves the debate down to fifth place instead of third place. There are 68 teams in March Madness and people still argue about the teams that get left out. Some people are saying we should stop complaining because we asked for it. Well, I didn't. The truth is that there's a standard way of selecting a champion from a large set of teams where it's not feasible for every team to play every other team. Yes, this can be done without adding any games. Here's how it would work. You can read my original 2009 proposal for more discussion. The five conference champions* from the Power 5** conferences. The top-ranked Group of Five** team (mid-major conferences), provided it is ranked in the top twelve or above at least one Power 5 champion. Additional top-ranked teams as wild cards to make a total of eight teams, except including no more than one wild card team from a single conference. Teams seeded in order of ranking with the order of the bottom four teams adjusted as necessary to avoid any team playing a rematch in the quarterfinals. The regular season is reduced by one game and a new Matchup Week is added after the conference championship games. The quarterfinals are played during Matchup Week. The rest of the teams play a comparably ranked team from another conference, paired on a rotating basis. For example, teams in the SEC East might play teams from the ACC Atlantic one year, and teams from the Big 12 South another year. This provides an exciting way to compare the quality of teams between conferences head to head. The four teams that win in the playoffs, advance to the four team bracket. The remaining bowl games are scheduled as they are now, including the four teams that lost in the quarterfinals. A Plus-One game, as now. As with the NCAA basketball tournament, this provides a clear path for teams to win the national championship. And it indubitably makes wins on the field more important than votes in a poll. UPDATE: Yes, the conference championships are effectively the first round of the playoffs. So this is really a 12 team bracket. (And it will be 13 teams if the Big 12 adds a championship game again as they are considering.) However, teams that lose in the first round still get a chance to make the quarterfinals as a wild card. * Yes, there is the unlikely possibility that a team with a losing record (and therefore not bowl-eligible) will win a conference. The conference loses its automatic bid in that circumstance but is still eligible for a wild card team. ** The set of power conferences (currently, Power 5) and mid-major conferences (currently, Group of Five) would be subject to periodic adjustment just as they are currently. Note: The puzzle is sized for 11×17 but is solvable if printed on 8-1/2×11. This puzzle is licensed under CC-BY-NC-ND-US. I'm one of those people who like to find puzzles in everything. I'm always looking for hidden puzzles, like anagramming names I encounter or reading text backwards. Which brings me to one of my favorite puzzles, shown on the right. Click here or on the image to download a PDF. 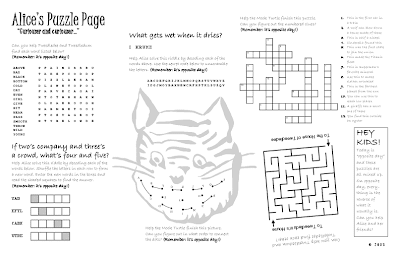 The idea behind this puzzle was to create a page that looked just like the puzzle placemats that restaurants use but was really much more. I wanted it to be completely solvable and enjoyable by kids. But beyond that, I wanted something there for the people like me that look for puzzles everywhere. I added another layer with a metapuzzle pulling all six puzzles together for a final answer. It was a bit complicated to make all the pieces fit together so I was fortunate to have help from two friends. I don't want to spoil anything, but there's one part of the puzzle that I hope you'll be amazed that it was possible to do. The puzzle was originally used in a puzzlehunt called "Alice in Puzzlehunt", inspired by the works of Lewis Carroll. We had a mad tea party that was a puzzle, a croquet game that was a puzzle, and a lot more. In addition, this puzzle was used as the "hidden puzzle" at one of the National Puzzlers' League annual conventions. The placemats were placed on the tables at lunch and it wasn't long before people were busy solving it instead of eating lunch. I thought people might be fooled and think it was put down by hotel staff, unaware of how juvenile the puzzles were. No such luck! I'm writing about this now because this puzzle was recently featured in the video puzzle in Puzzazz's Kickstarter campaign for a Year of Puzzles and that inspired me to post it here. I hope you enjoy it and I encourage you to check out the campaign. UPDATE: The Kickstarter campaign was a success! The Year of Puzzles is in progress and you can download the first puzzle for free at http://www.puzzazz.com/yearofpuzzles. To avoid spoiling this puzzle for others, please do not put the answer or any spoilers in the comments. The final answer is definitive -- you'll be sure you have it correct when you have it. If you have a question that isn't suitable for the comments, you can send me mail with questions at 'vroo' at this domain. I've written before about why using social security numbers as an identifier is a bad idea. But why learn from other's mistakes, when you can learn from your own? First Tech Federal Credit Union is the product of the merger of First Technology Credit Union and Addison Avenue Credit Union and they're finally integrating their banking systems. As always, there are a few hiccups in the process. For example, some members are getting new account numbers since there are conflicting account numbers between the two. you will be able to "use any of your account numbers to login"
"we'll reset your Phone Banking PIN to the last four digits of your social security number"
When you write a check, many businesses ask for the last four digits of your SSN for identification or verification purposes. So anyone with a copy of that check now has access to exactly what they need to access your account by phone. How sure are you that your account is safe? I'm not – which is why I asked First Tech to disable phone banking on my account. We could not issue new PINs to members because they would have to be issued after our system conversion, which would leave members without access to Phone Banking for at least several days. Setting the PINs to the last 4 digits of the Social Security Number allows members to continue to access Phone Banking during this system conversion. At this point we are moving forward with the plan as stated in the integration guide. I hope that First Tech will change this decision, but in the meantime, I know that many members will not be aware that their accounts are at risk. Unfortunately, I can't be as sure that hackers aren't targeting First Tech customers. In fact, First Tech is aware of this possibility and specifically advises people to watch out for "phishing" attacks during the transition. Therefore, I've decided to write this blog post to publicize the problem. I recommend that you disable phone banking for your account before May 26th. To do this, call 1-800-637-0852 option 2 or sign into online banking and send First Tech a message asking them to disable phone banking. Google unveiled a new trivia question a day site to encourage people to learn better searching techniques. "... signed me ... my importance ... I have ... What is it?" Why doesn't it end with "What am I?" Apparently, whoever wrote this isn't aware of how to properly use the first person convention in riddles. It just sounds awkward and ungrammatical and likely to confuse solvers. Personally, I would have used the word "readers" instead of "viewers" but that's a more minor quibble. Update: Yes, I know that "it" is the intended answer, but the question should have been written so that it was less confusing. A better way to write it would have been "Most modern readers think there's a glaring spelling error in a famous US historical document. Two future presidents signed it and two didn't because they were abroad. What is the error?" There's no doubt that the selection of teams for this year's NCAA Men's D1 basketball tournament was a complete debacle, with both the tournament selection committee and ESPN commentators proving that they have no special (or normal) ability to decide which teams belong in the tournament. Today, the NCAA announced a series of changes designed to improve the tournament. First, the tournament will roll back to 64 teams next year. This will avoid the possibility of a team like VCU, which really doesn't belong in the tournament, embarrassing the committee so spectacularly. Second, the NCAA will no longer use a committee to select the teams or seeding to match up teams. 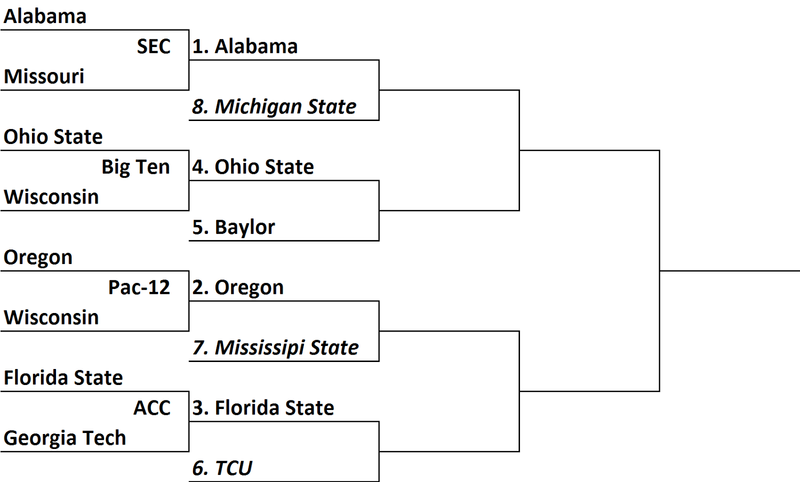 Instead, teams will be selected by the well-respected BCS selection algorithm and randomly dropped into the bracket. This should result in more interesting and competitive games as well as increased revenue for Las Vegas sports books. Legends – recognizes the conferences that can't think of good names and includes all the inanimate or otherwise perplexing mascots, including Zips?, Heat!? and Orange!?? The regions will be matched up differently each year on a rotating basis. So one year, the Dogs will fight the Cats for a Final Four berth while the next year, the Dogs might face the Birds. Teams that don't fit into any of the above categories will be arbitrarily and capriciously assigned to one using the same process that the selection committee has been using for seeding up until now. UPDATE: After posting this I learned that the Miami Heat is, in fact, an NBA not an NCAA team. My bad. UPDATE 2: Sorry, this is all made up. Except the part about the Big Ten (sic) having a Legends division. If there's a debate in the Senate and there's nobody talking, is there any noise? The US Senate has a long tradition of allowing unlimited debate but over time this tradition has been perverted: in today's Senate, Senators can filibuster without ever debating. And it's being increasingly abused: there have been more filibusters in the last 4 years than between 1920 and 1980. The worst abuse of the filibuster is the "secret hold" where one Senator can secretly block the Senate from doing its business. This has been used to block legislation as well as presidential nominations from being considered. It has no place in a democratic society: if a Senator objects to a bill or a nomination but wants to remain anonymous, tough. They were elected to represent the people of their state and the people have a right to know what they're doing. Of course the details here matter, because if anyone is good at finding and exploiting loopholes, it's politicians. So I hope the Senate keeps it simple. Honest, constructive debate — yes; obstructionism — no. "Led Republican resistance to ObamaCare in Committee." "Forced markup in Committee to take more than 17 days to complete." "Forced the Democrats to endure a 4-day markup, with 300 prepared amendments and 47 offered amendments." In other words, he stood in the way of healthcare reform, period. He didn't work to make it better. He didn't work to find middle ground. He didn't work to help Americans. And he's proud of it. Rachel Maddow (@Maddow) and the Huffington Post (@HuffingtonPost) have more to say on Joe Barton and George Patton.